There are many writers who have been scribing for years before they suddenly write that one book that gains international notoriety, and the writer becomes an instant celebrity. This is what happened to Ramona Lofton, or better known to the world as her pen name Sapphire. 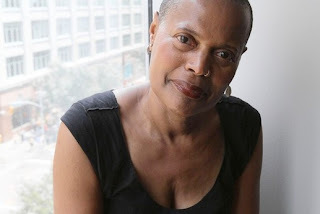 The writer had been established in New York’s poetry scene long before publishing her groundbreaking book, Push, in 1996. The story is about Claireece "Precious" Jones, an abused 16-year-old black teen living in 1980s Harlem. The book arose from Sapphire’s own experience working with at-risk youth during that time. The book was adapted into Lee Daniels’ 2009 Academy Award-winning film Precious. However, with praise also came criticism about the portrayal of black women in the film version. I talked to Sapphire at the Harlem Book Fair where she was doing a reading about the film’s backlash, what is great writing and what she is writing about these days. Many black critics highlighted at the time of the film’s release that it portrayed the black family as dysfunctional, especially the relationship between Precious and her mother. Sapphire said that she knew ahead of the movie coming out that there would be critics – or “haters” as she calls them - of the storyline. Push has also been frequently included on many banned book lists. Currently, she is promoting her latest book, The Kid, which is a sequel to Push. The book follows Precious’ son, Abdul, as he goes through the foster care system, where he is both the victim and victimizer of sexual abuse and finding his calling as a dancer. On the subject of good writing, Sapphire said “anyone can learn to be a great writer,” regardless of their personality. As a matter of fact, she said Emily Dickinson was one of the greatest writers, although she was a recluse who spent most of her life in her bedroom. Whatever she is writing about, Sapphire said she wants to inspire her readers, no matter what other people might think. Hey Very nice & interesting review about Push 7 its sequel Kid. I'll definitely read it.